Above: My choices from the Tom Ford Soleil Summer 2015 Collection. Above (from bottom to top): Swatches of the Cream and Powder Eye Color in Black Oyster, Naked Bronze, Golden Peach and Midnight Sea. 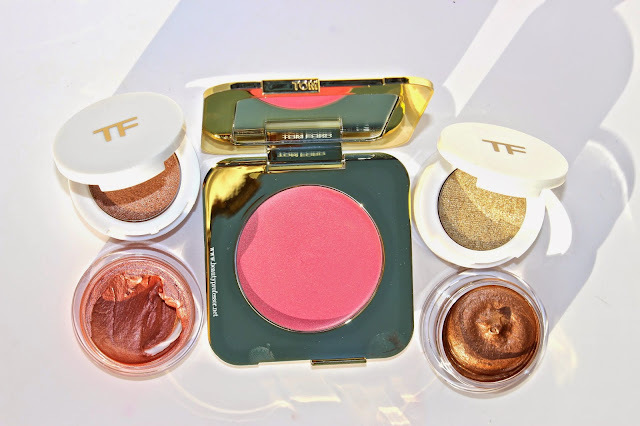 The first time I saw the Tom Ford Soleil Summer 2015 Collection was late last month in Dallas. I hastily swatched everything in sight at the Neiman Marcus at Northpark Center and quickly procured the Lip Color Sheer in Skinny Dip (reviewed HERE), knowing that two eyeshadows and the cream blush were en route to my house from an earlier pre-order. I was instantly taken by the rich pigment and smooth finish of the eye shadow duos and consequently couldn't wait for their arrival upon my return. Since properly photographing everything, I have been wearing the collection nonstop...it is simply that marvelous! Above: The majority of my choices from the Tom Ford Soleil Summer 2015 Collection (not pictured...Lip Color Sheer Skinny Dip...featured later in the post). Cream and Powder Eyeshadow in Golden Peach (reviewed HERE and currently only in stock at Neiman Marcus)...this dreamy combination features a shimmering rose gold cream shadow and a delicate warm gold powder shadow. The first day I wore this, my mom asked what I was wearing as it was different than my usual bronzy taupe eye; she said the effect was magnificent and I am apt to agree that this shadow duo is delightfully unique and universally flattering. I will be ordering a backup ASAP. Cream and Powder Eyeshadow in Naked Bronze (available at Neiman Marcus, Nordstrom and Saks)...a radiant bronze cream eyeshadow (darker than Platinum and lighter than Spice) and cool pale gold powder shadow make for a quintessentially easy neutral eye in 10 seconds flat. I love how the matching powder shadows set the cream for well over 8 hours of creaseless wear! Cream Cheek Color in Pink Sand (reviewed HERE and available at Neiman Marcus, Nordstrom and Saks)...a stunning debut, this sheer pink blush with a golden sheen imparts just enough color for a subtle flush while simultaneously adding a natural and radiant dewiness to the skin. Get this...I daresay, you will not regret it. 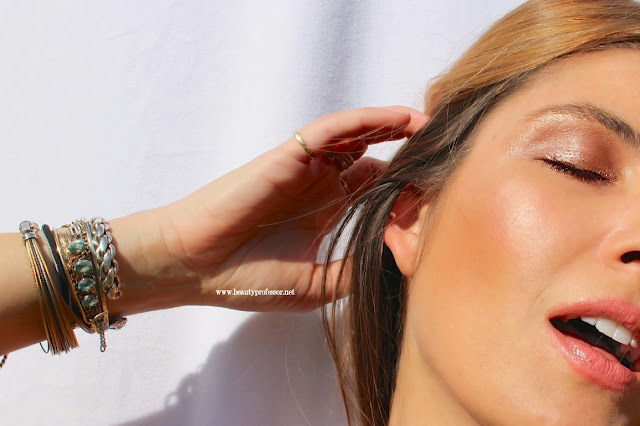 Lip Color Sheer in Skinny Dip (reviewed HERE and available at Neiman Marcus, Nordstrom and Saks)...I love this peachy pink hue; it has a lush, creamy texture, buildable pigmentation and a glowing, satin finish that makes lips look juicy and fresh. I am deeming this my new summertime neutral. 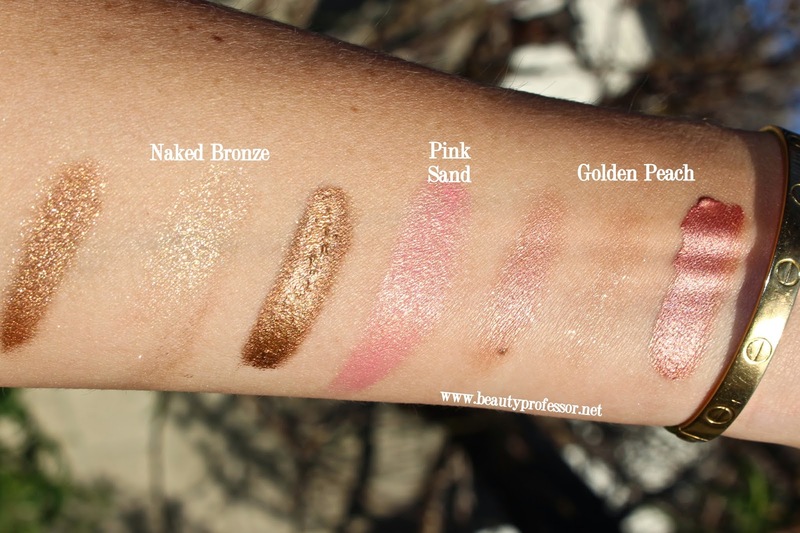 Above: Swatches of my Tom Ford Summer 2015 choices in direct sunlight with a flash. Above: The TF Lip Color Sheer in Skinny Dip, alone on the lips (also available at Nordstrom and Saks). Above: Wearing the Cream and Powder Eyeshadow in Golden Peach. Above: The full look in direct sunlight. Above: The subtle glow of the Pink Sand cream blush is apparent in this image. Above: Soft and sunlit shades. Above: Golden Peach...thanks for being so easy to work with. Above: Naked Bronze Cream and Powder Eyeshadow for a deeper, more intense look. Above: I smudged it along my lower lashline for a smoky vibe. Above: A darker eye look heightens the intensity of the existing makeup even though it is exactly the same. Above: It's official...I have a major affinity for the Tom Ford Soleil Summer 2015 Collection. Bottom Line: The Tom Ford Soleil Summer 2015 Collection (available at Neiman Marcus, Nordstrom and Saks) is sunkissed perfection. I am apt to remind you, dear readers, that the products discussed in this post are indeed limited edition and I have already witnessed products (like Golden Peach) sell out in a flash. I implore you to consider embracing the shades that are calling your name...they are sure to be a felicitous companion to the warmer months ahead! What has caught YOUR eye from the Tom Ford Soleil Summer Collection? Good things later on this week, including a fresh fragrance, a new lip color formula I'm loving, a skincare update and some enchanting product procurements. Fantastic, Viola...I think you'll love both! Thank you, Theresa! With regards to your question, it all depends on the coverage your are seeking. The orginal Traceless offers sheer coverage with a dewy finish and the new Traceless Perfecting (which I prefer) offers medium coverage with a natural finish that doesn't budge. 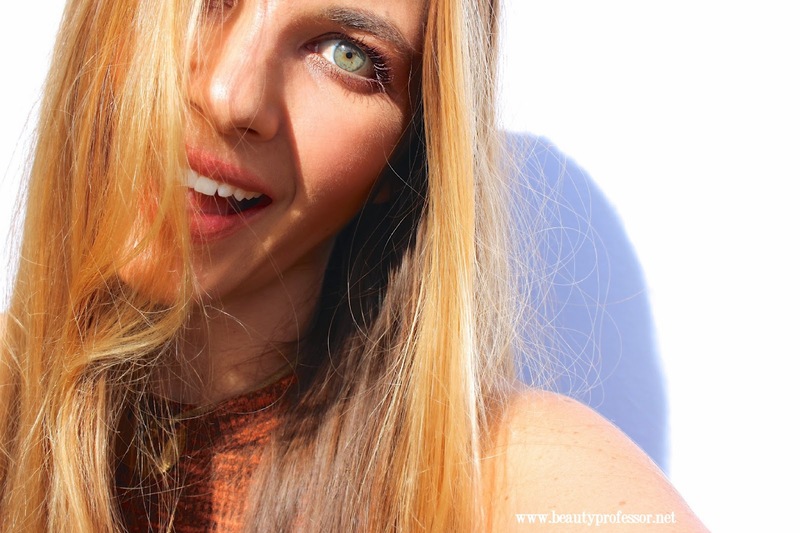 As long as your skin is moisturized and primed, either is a fantastic option! I adore this collection. 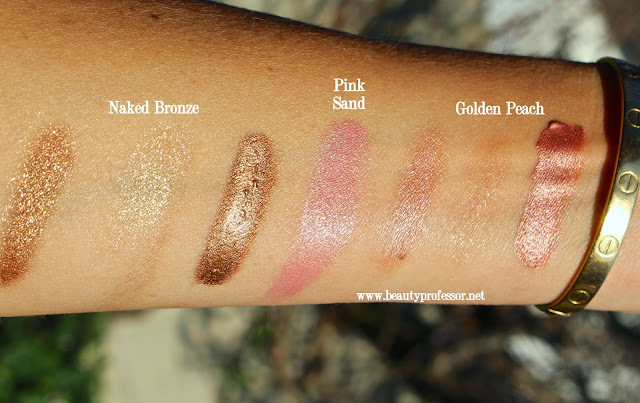 I splurged on the Skinny Dip Sheer Lipstick, Golden Peach Eyeshadow and Pink Sand Blush. I'm totally smitten! I agree the Golden Peach is a gorgeous shade. It really lights up my face. Thank you for your beautiful review. I so love your posts. Gorgeous picks! I grabbed the Midnight Sea eye color and the Eye and Cheek Compact! Thank you...love your choices as well! Amazing collection! What foundation are you wearing? Your skin looks perfect! Thank you! 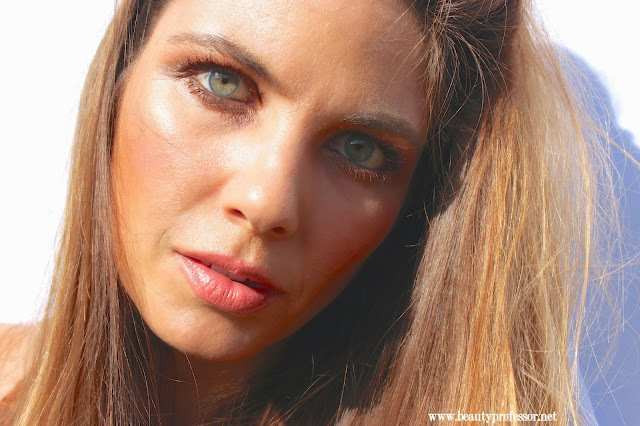 I am wearing Le Metier de Beaute Peau Vierge #2 and a mixture of the Napoleon Perdis Stick Foundation #3 and MustaeV Skinny Tint in Bright Beige. I got he same three products plus Rose Soleil lipstick and the Eye and Cheek compact. I love the way these products look on you!! That's fantastic to hear, Bella...I still have Rose Soleil on my mind ; ) Thanks for the sweet words! Thanks for the feedback, Annie...so glad you're loving Skinny Dip...it really is the perfect summer shade!